the most awesome haircut - can I have a turn?! A haircut. It is the most frightening thing to our almost 3 year old big boy. More frightening than a big spider, more frightening than watching Monsters Inc for the first time. I have battled with him to get him to sit in a chair at our local barbers and given up pinning him down half way through as it is just too painful to watch him in such hysteria. We have tried every trick in the book to make it a more enjoyable experience and even an endless supply of chocolate wouldn’t keep him sat down. So I now have a child who looks like he’s been dragged through a hedge backwards, permanently! However, there is a saviour and it is called Eskimo Kids! A fabulous children’s shop selling funky clothes, Melisssa and Doug wooden toys amongst lots of others and a hair salon upstairs designed by my new hero, whoever they are. They have 4 stations set up for children with different vehicles to sit in including a retro plane and a pink convertible. They have television screens in front on the wall under the mirror and a selection of loveable character dvds including Peppa Pig, Fireman Sam and have cbeebies on loop. The stylists Chloe and Gemma are kind, patient and above all have experience to deal with tricky customers. 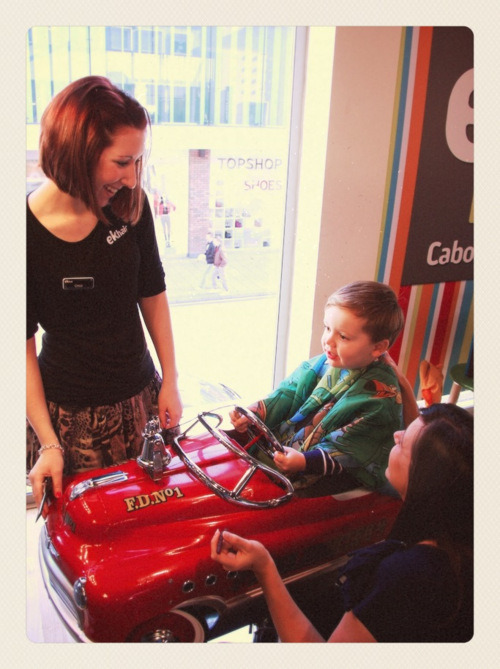 We took Sammy there for his first haircut and they made it a special experience, we came away with a keepsake card, all for £11. Totally worth the extra few pounds compared to our local barber. So we are back off to Bristol this weekend in the hope that they will be able to make my child look less feral! They have a fab online booking system of appointments in 10 minute slots (if you are going for the dry trim like we are) and they send a confirmation email. I will post the results of our hair adventure on Saturday. ps here he is the last time we went, cool right? !